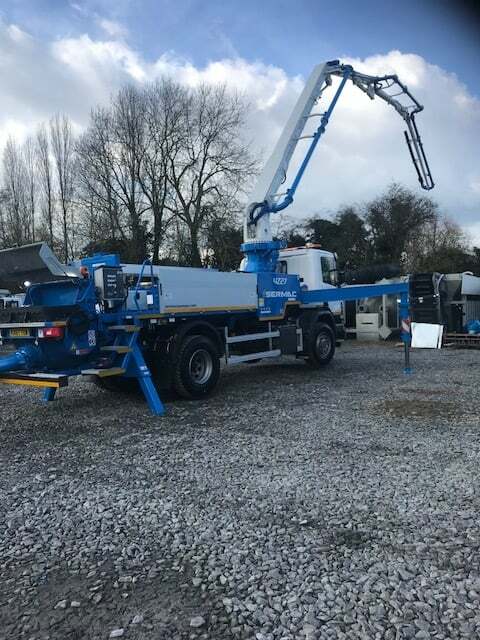 Need a concrete pump in Yorkshire? Then look no further as we have the answer here at Spot On Concrete! We can provide Concrete Pumping Services to the entirety of Yorkshire and surrounding areas. Here at Spot On Concrete, we have already built an unblemished image in the ready-mix concrete market that proves our services are unbeatable. With us, it does not matter if you are a trade or a DIY ready-mix concrete customer, you will still receive the best, most high-quality concrete pumping services from Spot On Concrete. It is pointless using manual labour to transport concrete with the wide availability of concrete pumps. If you are in Yorkshire or surrounding areas of Yorkshire. 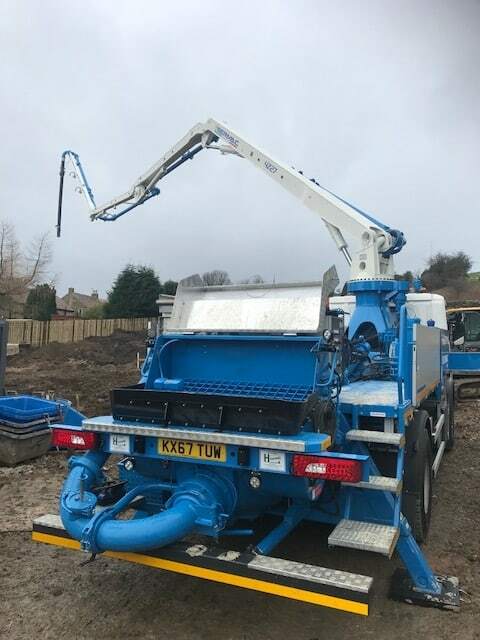 Boom Pumps – A boom pump uses a robotic arm to deliver ready-mix concrete and screed accurately. Boom pumps are most commonly used on construction sites as they have the ability to reach large heights and low depths, as well as being able to pump large volumes of concrete quickly and efficiently. Boomless Pump – A boomless pump does not have a robotic arm like boom pumps do. Boomless pumps rely on laying pipes from the vehicle to the lay site. 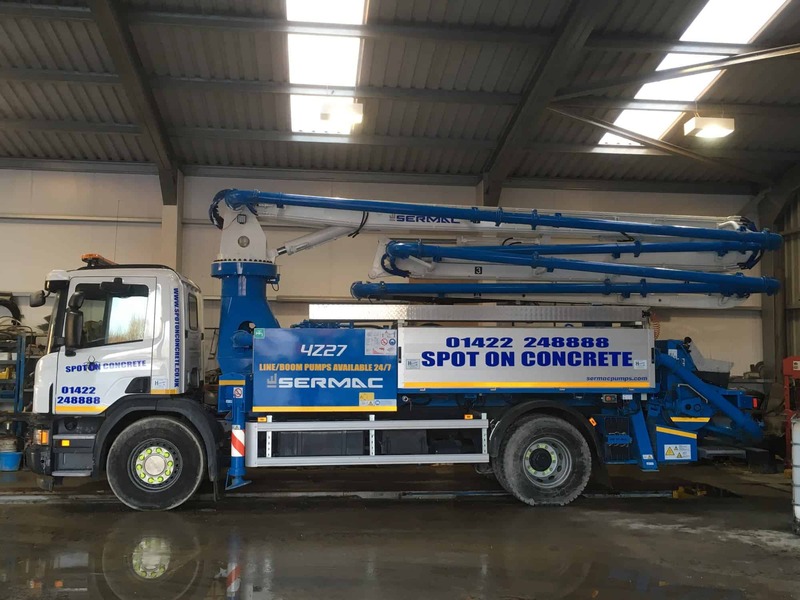 If you require more information on the concrete pumps available at Spot On Concrete, call us on 01422 898201. What are the advantages of using a concrete pump? 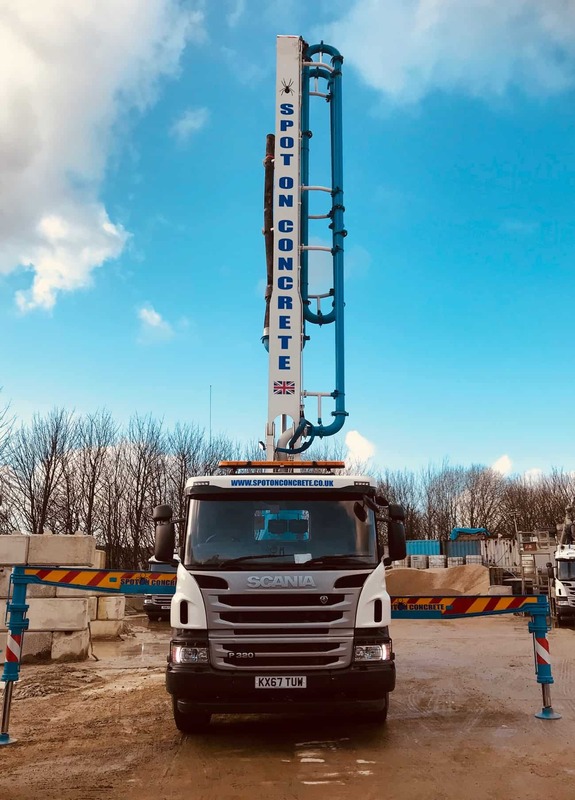 We can deploy and operate our concrete pumps throughout Yorkshire and surrounding areas including Halifax, Leeds, Huddersfield, Wakefield and Bradford. What concrete pumps do you use? When you hire concrete pumps from Spot On Concrete, you will always receive a fully trained operator for the concrete pump. The vast majority of our operators are CPCS qualified pump operators. You and your project will benefit from their considerable expertise and advice as to how and where to place the machinery upon arrival of the vehicle. 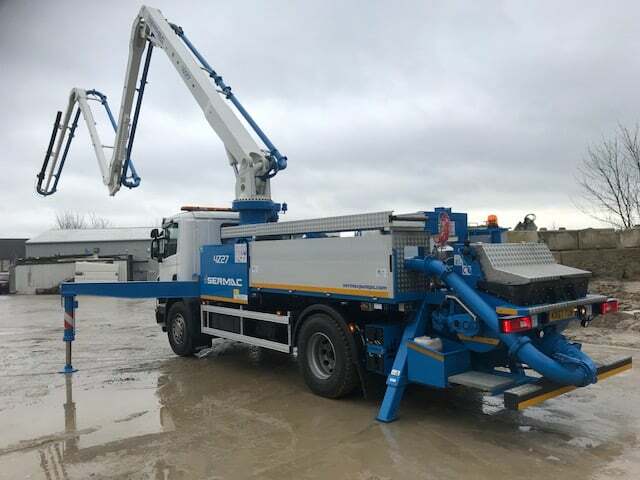 When the concrete pump is placed on the site, it will transport concrete where you want it in a much quicker and efficient way than traditional methods. Hire a Concrete Pump today! If you believe that a concrete pump would benefit your construction project, do not hesitate to inquire with us about what we can offer you. Additionally, to the hard work we provide at Spot On Concrete, we also provide expert advice for all of our customers and their projects that require concrete pumping. Spot On Concrete is fully understood that Concrete Pumping isn’t straight-forward; therefore leave the decision making to us! Feel free to call us on 01422 898201 to discuss your needs and to let us get to the bottom of what concrete services you require! We are very proud that we are a quality assured company accredited by the BSI (British Standard Institute) to Kitemark certification standard. In the north, we are the only volumetric concrete supplier to have achieved BSEN206, BS8500-1 and BS800-2 accreditation including ISO9001 and Constructionline certification.